After nearly a year of filming and post-production, the moment has finally arrived. 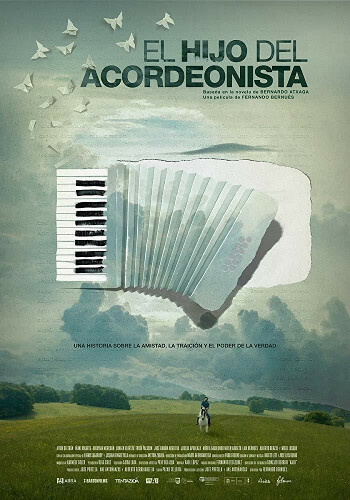 An advance screening of “The Accordionist's Son” was held in San Sebastián last week, followed by its premiere at the Instituto Cervantes in Madrid on April 8th. On April 12th it will open in theaters across the country. Based on Atxaga's novel “The Accordionist's Son” (originally published as Soinujolearen semea by Pamiela in 2003), the film was directed by Fernando Bernués and based on a script by Patxo Telleria. “Soinujolearen semea” (Pamiela 2003) is one of Atxaga's best-known works. It has been adapted to the stage and translated into 15 languages, including the English translation by Margaret Jull Costa, which was published in 2008 by Harvill Press in the UK and Graywolf Press in the US. And starting this week, audiences in Spain will be able to watch the film adaptation, which was written by Telleria and directed by Bernués. Filming started in May of 2018, and the cast includes Eneko Sagardoy, Aitor Beltran, Iñaki Rikarte, Joseba Apaolaza, Mireia Gabilondo, Frida Palsson and Miren Arrieta. An advance screening of the film was presented at the Human Rights Film Festival in Donostia-San Sebastián on April 5th. It then had its premiere in Madrid on April 8th at the Instituto Cervantes, with Bernardo Atxaga, Fernando Bernués and Pantxo Telleria in attendance. The film will be in general release starting Friday, April 12th.